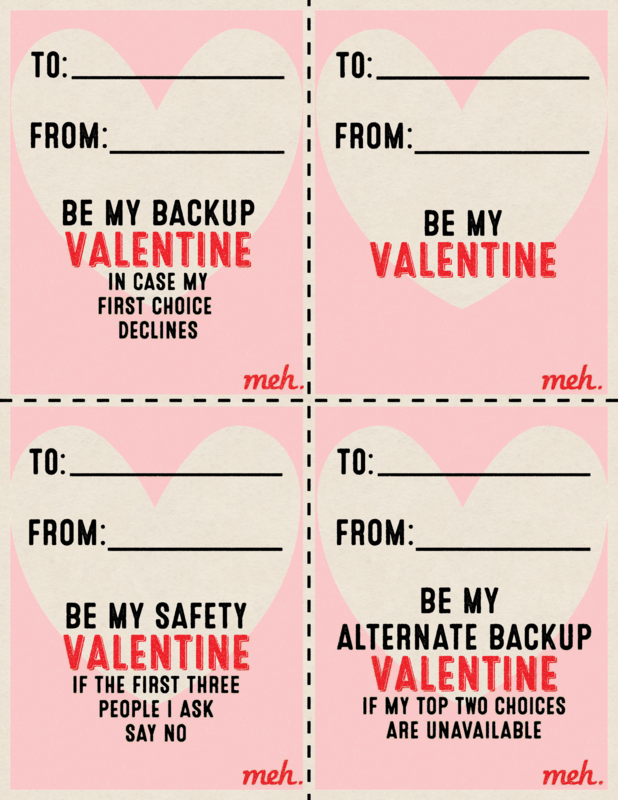 Note: it is advised you give these Valentines each to someone who does not know the other three people. Well, it’s not really going to work out well for you even if they don’t know each other. But still. No responsibility is taken by Meh or related entities for any harm caused to you by recipients. Logistical concerns? Having been in this situation, I would say it’s a bigger safety concern than anything else. @Kawa Just cut a single valentines card up into however many pieces equate to the number of people you’re currently dating. @ruouttaurmind I would seriously hope that if anyone I’m with has objections, they’d, you know, actually communicate with me about them, like the mature adults I hope they are. Most of the folks I’m dating are also dating other people, too, and the metamours (cuties of my cuties) I’ve met have been cool, reasonable humans too and I’m glad the cuties in my life have people that care about them and adore them besides myself. Ethical polyamory is real and just as hard than holding onto one relationship for years and years that is generally viewed as the ‘ideal’. And yes, there’s plenty of people who do it badly and abuse people’s generosity and trust, but there’s plenty of people in loveless and miserable monogamous relationships too. I remember that time when we got Valentines in the fuko. I might still have mine hidden away somewhere. No, I didn’t use them; the wife is less impressed with Irk and I have no backup; I live on the edge like that . Big ol laffs for me, thanks Irk! I still have my pack of six candy hearts that came in a fuko. They’re pinned to a wall in my office. I could look at them every day, but that would be pretty weird. can you make an image that has them full pages together so I can just print them 2 sided and BOOM no more corporate disasters where my boss asks me why I’m trying to size this perfectly using a glue stick at my desk with glitter and scissors? @triplebud Does you office have a duplex printer? @caffeine_dude @triplebud I do! Full color duplex laser. Not really print shop quality, but good enough. Hmm… which child do I like better? 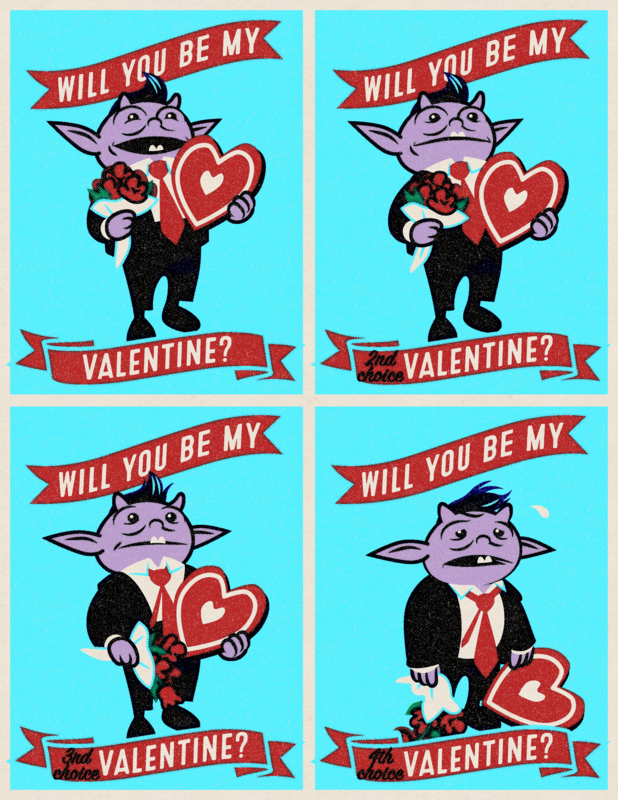 Have I mentioned Valentines Day is my birthday? @Pamela I’ll try to remember but no promises. @Pamela it’s my pup’s birthday too. She’s an incredibly sweet being; do you consider yourself to be also? @guyfromhawthorn I try to be sweet most of the time but your pup is probably sweeter. And Happy Birthday!